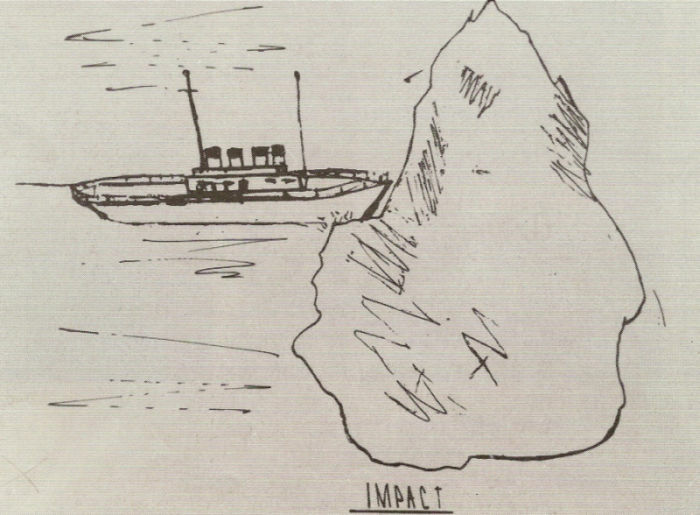 Drawing by Frederick Fleet who saw the iceberg which Titanic struck about 37 seconds before impact. Image part of the Titanic hearing record. (See both the hearing, in the US, and the wreck inquiry, in the UK.) Online, courtesy U.S. National Archives. It was freezing cold in Titanic’s crow’s nest. The beautiful sunset was a distant memory as Frederick Fleet and Reginald Lee were nearing the end of their watch. It was hard to see the horizon, or much of anything else, on this moonless, windless Sunday night. The seas were completely calm, eliminating any chance to see water breaking at the base of any icebergs. Without binoculars, the lookouts had to rely on their own unaided eyesight. I have no idea of distances or spaces. It kept getting larger as we were getting nearer it. Fleet later drew a picture of how large he thought it was. Looking at the picture today, one can only imagine his horror then. Murdoch, chief officer on the bridge, immediately ordered the helmsman, Robert Hitchens, to turn the wheel "Hard astarboard." But, during the time, she was crushing the ice, or we could hear the grinding noise along the ship’s bottom. I heard the telegraph ring, sir. The skipper came rushing out of his room - Capt. Smith - and asked, "What is that?" Mr. Murdoch said, "An iceberg." He [the captain] said, "Close the emergency doors." ...Mr. Murdoch replied, "The doors are already closed." Scientists believe Murdoch could have saved the ship had he not given the order to turn it. Given Murdoch’s likely view of the berg from the bridge, however, one can understand his order. Today, thanks to Dr. Robert Ballard’s discovery of Titanic, we can see the damage she sustained. It wasn’t a 300-foot gash along the side of the starboard bow. Instead, she had six separate tears, totaling less than 15 square feet. Within 5-10 minutes after striking the berg, the ship had a starboard list of 5 degrees. Bos, Carole "ICEBERG RIGHT AHEAD" AwesomeStories.com. Mar 01, 2004. Apr 20, 2019. How Does Fear Exaggerate Our Perceptions?